Not many pinups gain mainstream fame. Bettie Page is one of the exceptions. As such, she's had several card sets highlighting her body of work (pun only partially intended). 2014 Leaf Bettie Page Collection features a mix of base cards, inserts and the promise of one premium autograph, memorabilia card or sketch card per box. The 72-card base set is dedicated to iconic photographs of the late model. It's complimented by a pair of basic insert sets. Queen of the Pinups is a 16-card set that focuses on more photos. Calendar Girl uses a calendar theme. As such, it has 12 cards, one for each month of the year. Every box of 2014 Leaf Bettie Page Collection comes with one hit. Sketch Cards come with original artwork done directly on the card. Each is unique. Cut Signature cards land at a rate of one or two per 12-box case. These come with a Bettie Page autograph that has been embedded into the card. Wardrobe Cards have a piece of a nightgown worn by the pinup queen. 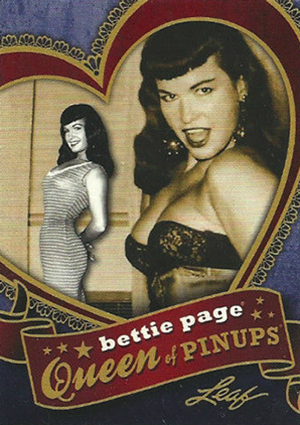 For many, the strangest cards in the product will be Hair Cut Cards that feature real Bettie Page hair. 2014 Leaf Bettie Page Collection is limited to 150 cases. 5 cards. Parallels are numbered to 10 and 1. Versicolor put out a couple of sets a couple of years ago that had some tough inserts and lots of sketch cards. Due to their nature of having original artwork, the sketch cards are all unique to a certain extent. I believe Benchwarmer put out some autographs some years ago, although I’m not totally familiar with them.